To date there have been 27 issues of The Crow's Nest. Below is an index of the contents of each issue. If you wish to purchase a copy of those still available you should contact the Secretary. Front cover – 'The Decision' by Bill Holm. Editorial – Kevin Galvin outlined the aim of the newsletter and introduced the articles. Presidents Message – Francis Taunton produced a one-page message to members. Chairman’s Message – Lawrence Sherrington told of his amazement of how the CAGB had grown as an informal gathering to a fully pledged organisation. Battlefield News from the Superintendent – Neil Mangum. Black Hills Expedition 1874 – Introduced by Peter Russell, although not formally credited to him. The Deer Rutting Moon Gathering on 18 November 2000 and Agenda for Meeting 5 May 2001 – Peter Russell. Book Review – Little Big Horn by Robert Nightengale reviewed by Francis Taunton. British Custeriana Series – Kevin Galvin. Origin of the Crow’s Nest. Decision at the Crow’s Nest – Brian Pohanka. Editorial – Kevin Galvin concentrated on the 125th Anniversary and Staff Ride. The Decision – Why Bill Holm produced this excellent piece of art. Meetings in London and York – Peter Russell described the two meetings held on the 17 March 2001 and 5 May 2001. Whose Last Stand? – John Gould. A personal view of the events at the 125th Anniversary. Riders of the Rosebud Range – Francis Taunton described the ride on horseback to cover the battle of the Rosebud. Exercise Western Trail 2001 – Terry Hurley in conjunction with Lt Col Hugh Taylor (Ministry of Defence) gave another view of the Staff Ride. From Beecher Island to Summit Springs – John Statham described his visit to a number of locations including the Kidder Massacre site. 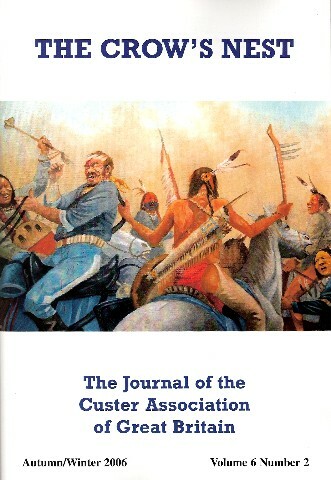 Book Review – Facts about Custer and the Battle of the Little Big Horn by Jerry Russell reviewed by Michael Barrett. Back cover – Photographs of the 125th Anniversary. Front cover – 'The Sniper' by David Shanahan. Editorial – Kevin Galvin covered the contents and controversy regarding Kidder. Biography David Shanahan – Artist. The Deer Rutting Moon Gathering 17 November, 2001 – Peter Russell provided news on the event that had included presentations on the 125th Anniversary, Staff Ride and the Big Hole Fight. Rubbing Out Longhair: An Examination of the Indian Story in 1876 – Rod Thomas followed up his talk on 17 March 2001 with this article on how Indian art tells the story of the battle from the Indians perspective. He Thought His Ancestors Came From Orkney – Peter Russell’s article on Custer’s Orkney connection. Treaty Obligations and the Sioux War of 1876 – Francis Taunton. 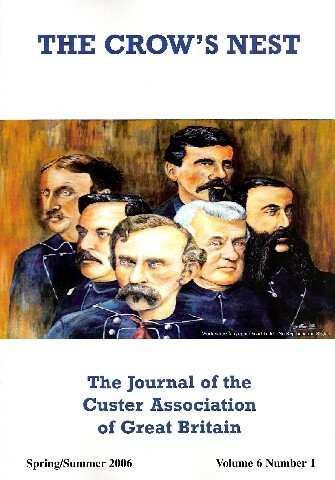 Orders For Custer – John Statham followed up his travel diary in Issue 2 with this article on Kidder. Heartsong by James Welch reviewed by Ken Doran. The Premonition by Don Striver. Editorial – Kevin Galvin main theme Custer Industry plus normal introduction to articles and reviews. The Planting Moon Gathering 18 May, 2002 – Peter Russell. The Kidder Debate Continues – Letter from Don Fisk. The Kidder Memorial Plaque – Peter Russell. Meeting of Scottish Members – Ken Doran. A Celebration of the American West – Mark Gallear describes his visit to the Royal Armouries in Leeds, which included a sketch on Sgt Charles Windolph’s recollections of the battle. A Tribute to Neil Mangum – Kevin Galvin pays tribute to Neil Mangum on his move from LBH to Arizona and for what he achieved at the battlefield. From Bungay to the Little Bighorn – Peter Russell’s three page article on Frederick Nursey who was a member of F Company and died with Custer’s command. The Fate of Company F – Peter Russell describes the fate of F Company commanded by Captain Yates and the British connection. Custer’s Vision – Jerry Brown articulates the vision of events that Custer might have envisaged on the 25 June 1876. Film/Video Review – Darrell Dorgan’s documentary of Fort Abraham Lincoln entitled The Western Edge is reviewed by Mike Martin. The Fatal Environment by Richard Slotkin reviewed by Mike Christian. 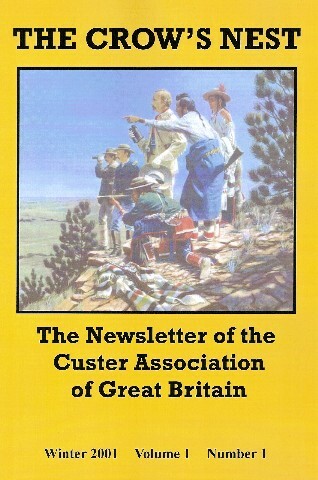 Back cover – Colour adaptation of Black and White map from John Gray’s book Custer’s Last Campaign depicting locations of grave markers on the battlefield. 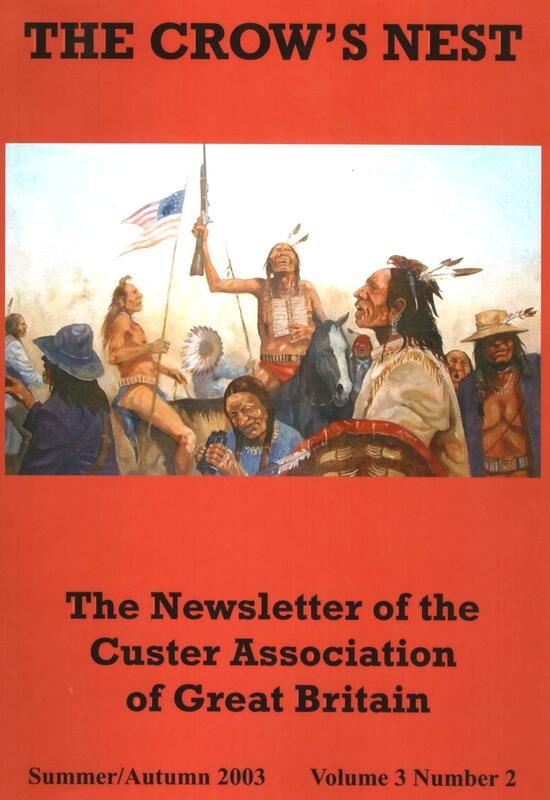 Front cover – Michael Nunnally painting of Custer as he might have appeared on the day of the battle. Editorial – Kevin Galvin. Opened with tribute to the late Dee Brown and continued the theme of the Custer industry plus comments on articles and reviews. Biography Michael Nunnally – Artist. E-Mail to the Editor – Comments on Book Reviews by Linda Terrell. Respectable Laundresses of the 7th – extract from The Times. Appointment of Vice-Presidents – two biographies of Derek Batten and Joan Croy. Governor’s Invitation – Invitation from Governor of North Dakota. The Deer Rutting Moon Gathering November 2002 – Peter Russell. Custer’s Sergeant Major – William Sharrow – Peter Russell. Toške Lakotiya Eyapi Hwo? [How do you say it in Lakota?] – Tim O’Sullivan. Lakota – The Language of the Sioux – Harry Seabourne. 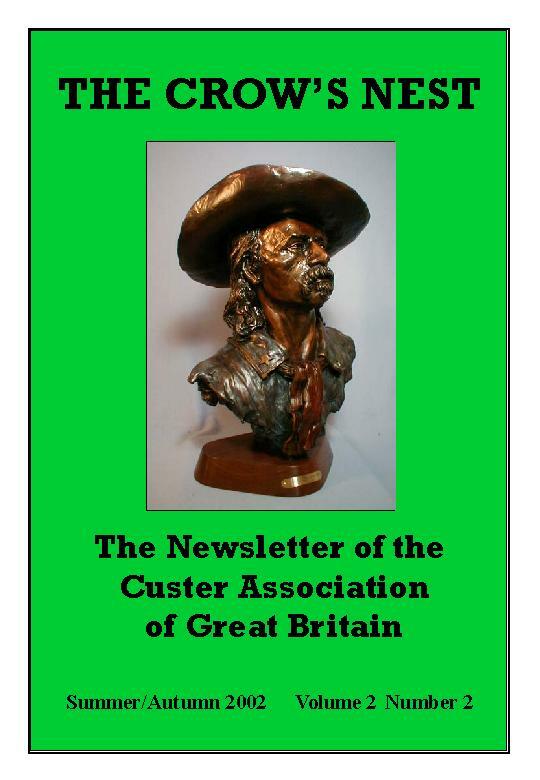 Casting Custer – Jimmy Perry plus bibliography of Jimmy Perry and photograph. Scalp Dance by Thomas Goodrich reviewed by Mike Martin. Back cover – Michael Nunnally artwork, a cameo of officers of the 7th. Front cover – ‘Victory Celebrations’ by David Shanahan. Editorial – Kevin Galvin. Linked the two dedications in the USA and Editors trip to Civil War Battlefields plus introduction to articles and reviews. Letter to Editor – Tom O’Neill discusses Deep Ravine and suggests the debate should be put to sleep. Report on Lecture by Barbara Sutteer a past NPS at LBH who gave a lecture at the Royal Armouries in Leeds in May 2003 – Mike Christian. It’s Playing Our Tune (But only on Fridays!) - Kendal Town Hall Clock plays Gary Owen every Friday – this report by Mike Christian. The Planting Moon Gathering, 17 May 2003 – Peter Russell. From Bear Butte to the Little Bighorn by Neil Gilbert. Yes! Let Me Like A Soldier Fall by John Mackintosh. The Man Behind the Ridge by Kevin Connelly. Kidder Party Memorial Plaque Dedication by Randy Johnson. American by Blood by Andrew Huebner reviewed by Derek Ware. Statement of Account 1 June 2002 – 31 May 2003. Back cover – Photographs taken by Sandy Barnard at Indian Memorial Dedication. 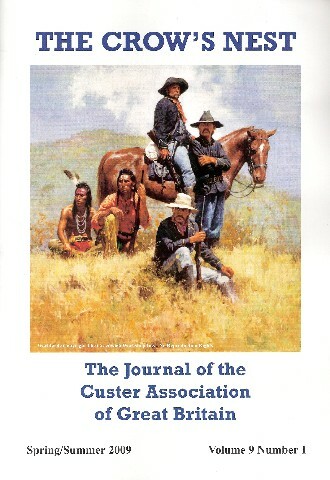 Front cover – ‘Here Fell Custer’ by Eric von Schimdt. Editorial – included tribute to Jerry Russell. Letter to the Editor from Peter Harrision. 2004 Super Bowl Winner's Ancestor – Peter Russell. The Deer Rutting Moon Gathering on 15 November 2003 – Mike Christian and Peter Russell. Yr Unig Gymro – The Lone Welshman [Sgt James] by Peter Russell. Fate of the Grey Horse Troop – Peter Russell describes the fate of E Company commanded by Captain Smith and the British connection. Scottsville on the James – Peter Russell. Mark Kellogg – The 7th Cavalry's First Embedded Reporter – Sandy Barnard. A Dane Who Survived the Little Big Horn Fight [Jans Mollar] by Leif Rudi . 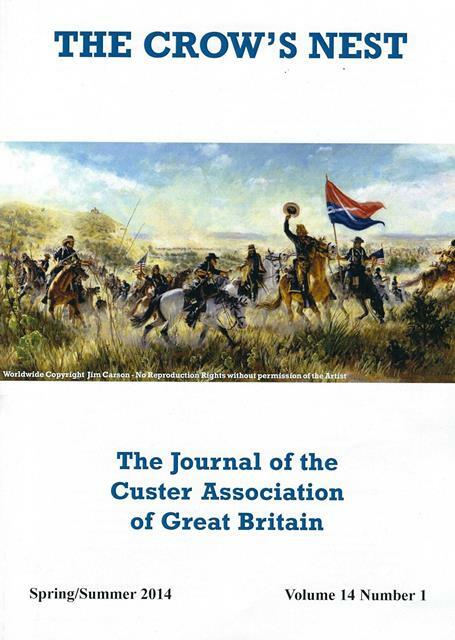 Book Review – Custer Victorious by Gregory Urwin reviewed by Kevin Galvin. Back cover – ‘Here Fell Custer’ by Eric von Schimdt. Front cover – ‘Trumpeter Fisher and Lt Hodgson’ by Ralph Heinz. Editorial – Once again the death of a member – Colin Taylor – featured in the opening paragraph. The rest of the Editorial highlighted the contents and eluded to a possible future article comparing the Sioux War of 1876 with the Anglo-Zulu War of 1879. Colin Taylor Tribute by Barry Johnson. Biography – Ralph Heinz – Artist – by Kevin Galvin. The Planting Moon Gathering on 15 May 2004 – Mike Christian and Peter Russell. Custer’s Osage Scouts by Arthur Shoemaker. Custer’s Quartermaster Sergeant – T W Causby by Peter Russell. Opening of NMAI – Tracy Potter. What the Papers Say – Extracts from Daily Mirror and Bismarck Tribune. UK CAGB Visit the Northern Plains – Photographic Record. CAGB Members meet in Ǻlborg – Richard Pratt. Statement of Account 1 June 2003 – 31 May 2004. Back cover – Opening of NMAI photographs. Front cover – ‘Captain Keogh and Lieutenant Porter of I Troop’ by Mike Schreck. Editorial – Highlighted a milestone of producing same number of issues as The Guidon. Letter to the Editor regarding 'Guns at the Little Big Horn'. Biography – Mike Schreck – Artist – by Kevin Galvin. The Origins and Ethos of the CAGB – Kevin Galvin. The Deer Rutting Moon Gathering, 13 November 2004 – Mike Christian and Peter Russell. Back to the Beginning – Little Big Horn Revisited 2004 – Derek Batten. The Final Moments of "Wild I" – Mike Martin. A Dane Who survived the Little Big Horn Fight – Leif Rudi Ernst. The Battle of Appomattox Station – Peter Russell. A Visit to the NMAI – Kevin Galvin. They Call Him, "The Man Who follows Native American Indians". Forgotten Scottish Heroes reviewed by Peter Russell. Back cover – 'Myles Keogh' by Gerry Stevenson. Front cover – ‘His Brother’s Keeper’ by Mark Churms. Editorial – Once again the death of a member – Brian Pohanka, featured in the opening paragraph. Letters to the Editor – Letters from Lee Noyes on the subject of the Springfield Rifle, Tom O’Neil on Wild I and Barry Johnson and origins of claims that Keogh used his swagger stick to ‘beat’ his soldiers. The Planting Moon Gathering, 21 May 2005 – Mike Christian and Peter Russell. News from North of the Border by Ken Doran. Brian Caldwell Pohanka – An Obituary by Francis Taunton. Magnificent Obsession by Derek Ware. My Life as an Irish Dragoon (Article on being a living historian playing Myles Keogh) by Bill Rini. The Seventh’s Quartermaster by Barry Johnson. Book Review: Red Sabbath by Robert Kershaw reviewed by Francis Taunton. Back cover – Re-enactment 2005 photographs. Front cover – ‘The Seventh: Friend and Foe’ by David Todd. Biography David Todd – Artist. Biography Paul Smiley – Artist. The Deer Rutting Moon Gathering, 12 November 2005 – Mike Christian and Peter Russell. The Seventh’s Quartermaster [Henry J. Nowlan] by Barry C. Johnson. House named after Nowlan at Fort Huachuca by Kevin Galvin. The Elusive Henry Holden by Peter Russell. 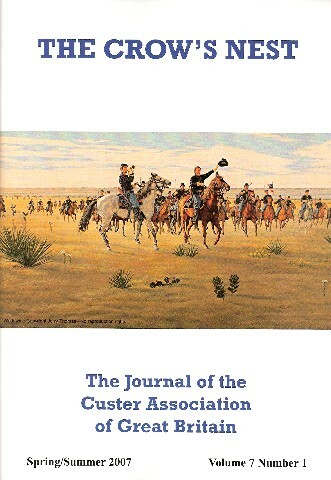 Book Review: US Army in the Plains Indian Wars 1851-91 by Clayton K. S. Chun reviewed by Francis Taunton. Back cover – ‘Custer’ by Paul Smiley. Front cover –‘No Way Out’ by David Shanahan. The Planting Moon Gathering, 20 May 2006. The Lost Scalp of Delos G. Sanbertson – an investigation by Peter Harrison. Doug Scott at the British Library – Derek Batten. The 130th Anniversary – Megan Reece. Photographs from the Anniversary weekend – Photographs taken by Kevin Galvin (Centrespread). 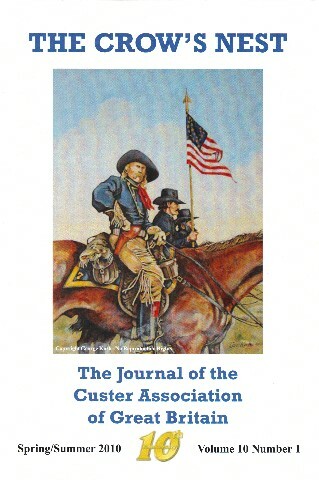 Intuitive Vision v Practical Realities: Custer at the Little Bighorn. An article first published by the US Army Combat Studies Institute. Written by Major William A. L. Campsey. Nowlan Speaks – a short piece on a letter written by Nowlan to Miss Keogh by Elisabeth Kimber. Dog Soldier Justice by Jeff Broome reviewed by Kevin Galvin. 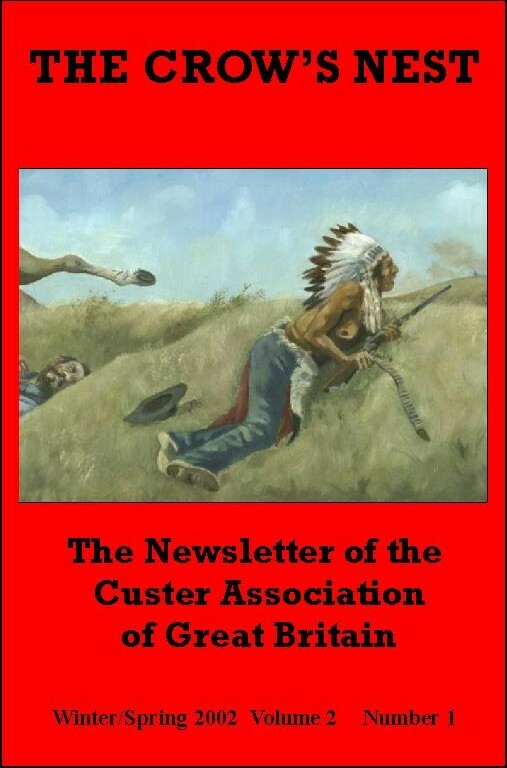 Film Review – Custer’s Last Fight by Stuart McCloy. Statement of Account 1 June 2005 – 31 May 2006. Back cover – Photograph of Godalming Parish Church, Surrey taken by Peter Russell and inset photograph of Charles DeRudio who married Eliza Booth at the church in 1855. Front cover – ‘Get ‘Em Boys’ by Jerry Thomas. Biography Jerry Thomas – Artist. Biography Andy Amato – Artist. The Deer Rutting Moon Gathering, 11 November 2006. Trip of a Lifetime by Gordon Richard. The Slain Sergeant [Frederick Wyllyams] by Peter Russell. Frederick Wyllyams: The Photograph by Gary Leonard. Dr. William Abraham Bell by Peter Russell. Custer’s Mission for Benteen by Mike Fox. 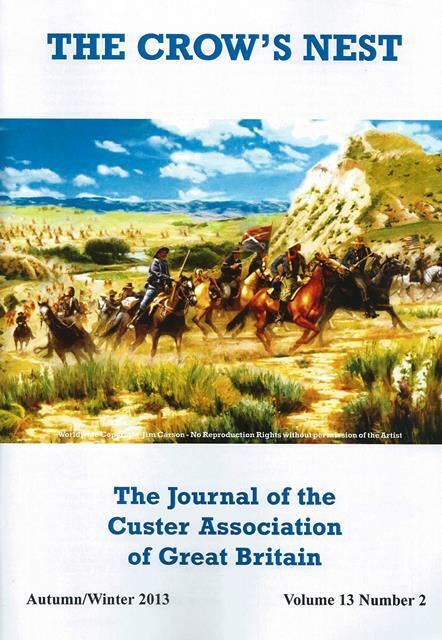 Re-Riding the 1876 Custer Trail by Michael “Buck” Clark. Mystery Mancunian drowns in Missouri River [Thomas Tattersfield] by John Tattersfield. Documentary Review: A Good Day to Die by Mike Barrett. Back cover – ‘Custer’ by Andy Amato. Biography Rick Reeves – Artist. Biography Kenneth Ferguson – Artist. Letter to the Editor from Barry Wyllyams. E-mail to the Editor from C. Lee Noyes. Custer in Monroe with War of 1812 Veterans? – a photograph. The Moon When the Green Grass is Up Gathering, 9 June 2007. Riding in the Hoof Prints of History by Derek Ware. The Bangor Experience by Derek Batten. The Little Bighorn Alive and Well in British Schools by Robin Sadler, with introduction by Kevin Galvin. Men from the United Kingdom of Great Britain and Northern Ireland who served with the 7th U.S. Cavalry Regiment at the time of the Battle of the Little Big Horn – 25 & 26 June 1876 [A schedule of all 64 members plus notes] by Peter Russell. Benteen’s Route and Timing by Mike Fox. Cracking the Horsewhip Story by Peter Harrison. Statement of Account 1 June 2006 – 31 May 2007. Back cover – ‘Brave Bear’ by Kenneth Ferguson. Front cover ‘The Victor’ by Michael Schreck. From the Chairman – includes portraits of all five Committee members. 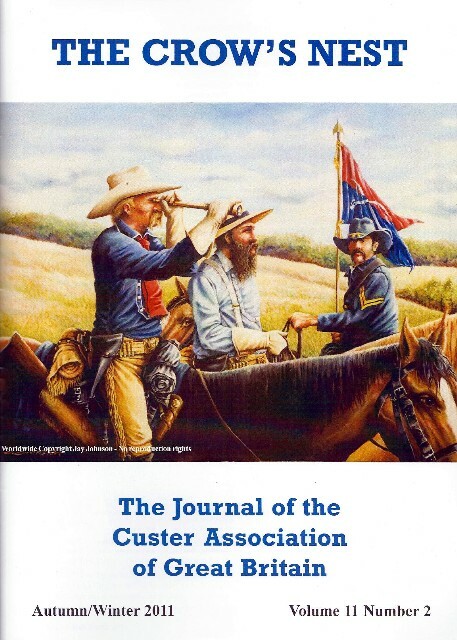 Emails to the Editors from Mike Fox (Custer’s Mission for Benteen); Don Fisk (Benteen’s Route and Timing) and Steve Goldsmith (Custer and the War of 1812 Veterans). Where was Custer in June 1870? By Peter Russell. The Deer Rutting Moon Gathering, 10 November 2007. “A Fortnight with Sheridan”: Keogh and the 1868 Campaign’ by Elisabeth Kimber. He Died With Keogh [Felix J. Pitter] by Peter Russell. The Bangor Experience – Again by Lawrence Sherrington. The Little Big Horn Alive and Well in British Schools – Part 2 by Daniel Roberts, with introduction by Kevin Galvin. “Lame White Man Fell Near Here” or The History of the Warrior Markers at Little Bighorn Battlefield National Monument and How the Markers Almost Never Happened by Bob Reece. Book Review: Touched by Fire: The Life, Death, and Mythic Afterlife of George Armstrong Custer by Louise Barnett reviewed by Kevin Galvin. 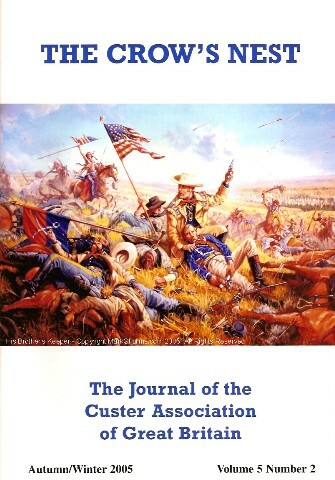 Back cover – Warrior Markers at the Little Bighorn Battlefield. National Monument – Six photographs by Bob Reece and one by Kevin Galvin. Front Cover – ‘Crazy Horse Sacred Warrior’ by Michael Gentry. Biography Michael Gentry – Artist. The Planting Moon Gathering, 10 May 2008 – Gary Leonard. No Ordinary Trooper: The Extraordinary Life of Private James Pym by Peter Russell. Crazy Horse – “… one of the most remarkable men of his remarkable race …” by Kevin Galvin. 80th Anniversary of the Death of the Man from Markinch [Peter Thompson] by Peter Russell. Custer’s Thorn: The Life of Frederick W. Benteen by Jules C. Ladenheim reviewed by Gary Leonard. Statement of Account 1 June 2007 – 31 May 2008. Back cover – ‘Strange Man of the Lakota, Crazy Horse, Oglala Lakota, circa 1876’ by Kenneth Ferguson. Biography Howard Terpning – Artist. Letters to the Editors: John Harvey and Derek Batten. The Deer Rutting Moon Gathering, 8 November 2009 – Gary Leonard. Peter Harrison (1947-2009) – Obituary by Gary Leonard. Take the Gatling Guns, by George by Donald Fisk JD. Keogh’s Private Gettysburg Battle by Elisabeth Kimber. Black Elk – An Indian Life by Harry Seabourne. Captain Frederick W. Benteen’s Disobedience at the Little Bighorn – Part 1: The Case for the Prosecution – a transcript of the debate held at the 8 November Gathering 2008. Book Review: Crazy Horse: A Lakota Life by Kingsley Bray reviewed by Francis B. Taunton. Back cover – 'Black Elk' by Bernard John. Front cover – ‘Signalling the Squaws’ by Richard S. Headley. 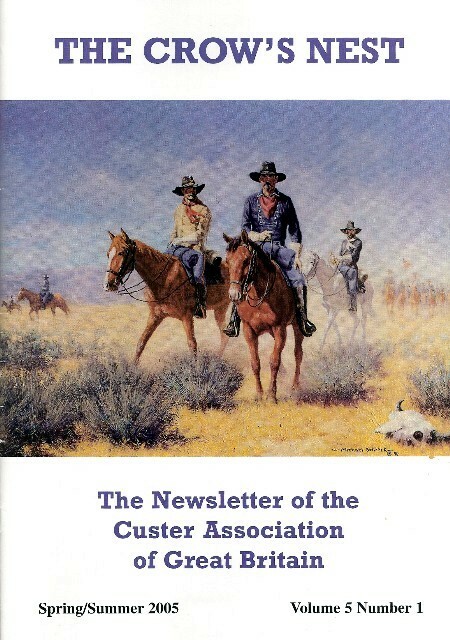 Letters to the Editor – Two letters relating to Custer’s messages to Benteen. Visit to United States Military Academy at West Point by Jim Puppe. The Planting Moon Gathering Report, 6 June 2009 – Peter Russell. A Weekend with ‘Friends’ by Kevin Galvin. The Job Custer Almost Accepted by Lawrence Sherrington. 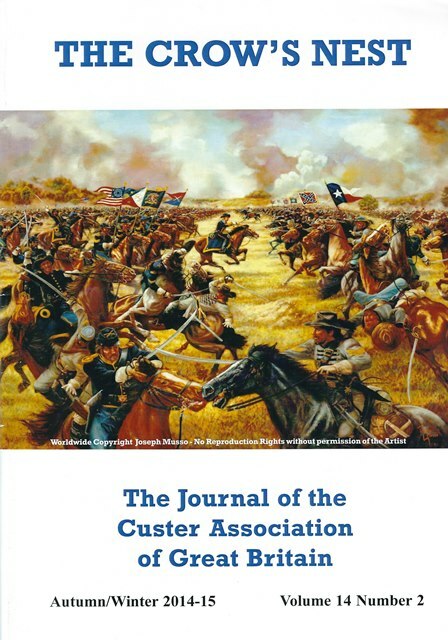 Captain Frederick W. Benteen’s Disobedience at the Little Bighorn Part 2: The Case for the Defence – Mike Fox – A transcript of the debate held at the 8 November Gathering 2008. A Stab in the Dark (Charles De Rudio) by Peter Russell. Sitting Bull’s Pipe: Rediscovering the Man, Correcting the Myth – Ian West. Statement of Account 1 June 2008 – 31 May 2009. Back cover – ‘Visions of Glory’ Richard S. Headley. Front cover – ‘Yellow Hair’ by George Kush. From the Chairman – Peter Russell. Biography George Kush – Artist. The Deer Rutting Moon Gathering Report, 7 November 2009 – Gary Leonard. From Montana to the Mount by Derek Batten. Charles De Rudio and Eliza Booth by Peter Russell. Sergeant William H. Sharrow Revisited by Peter Russell. “… paying homage to Comanche ..” by Kevin Galvin. The CAGB: The First Ten Years. A Personal View by Lawrence Sherrington. Fiddler’s Green – Eight members of the Association who died during the last 10 years. Photographs from the last 10 Years – a full colour centre-spread – Kevin Galvin. Major Reno’s Defence. Presented by his ‘Alter Ego’ – Derek Ware. Another Dane who survived the Little Big Horn Fight (Christian Boisen) by Leif Rudi Ernst. Film Review: Little Big Horn – Mike Christian. 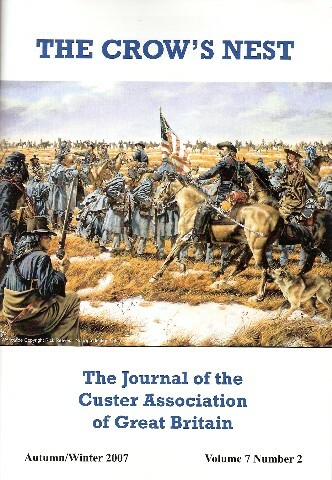 Book Review: Crossing the Plains with Custer – Rod Thomas. 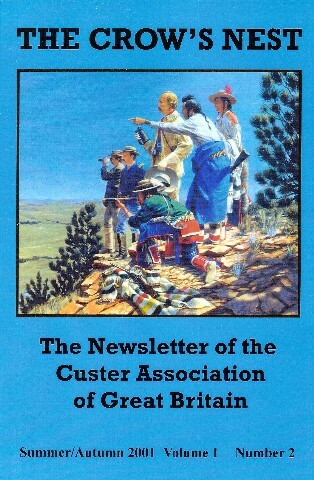 Back cover – ‘Canucks with Custer’ by George Kush. Biography Edward Willard Deming – Artist. 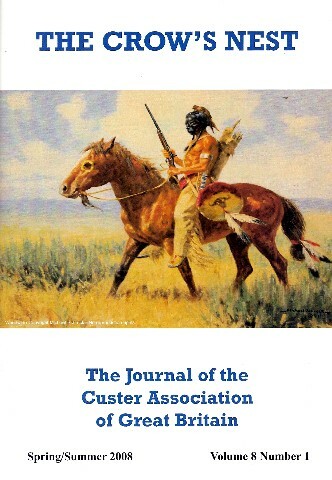 Letters to the Editor – Two letters on Custer films relating to the film review in Volume 10, Number 1 and one with reference to the article on Comanche. The Deer Rutting [should have read Planting Moon] Gathering Report, 12 June 2010 – Gary Leonard. 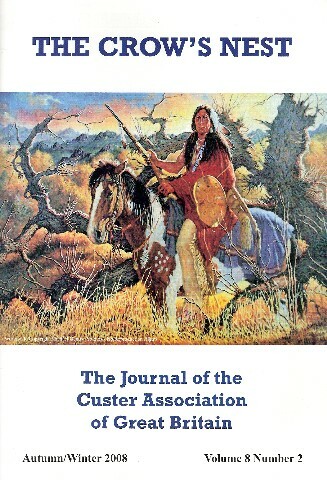 My Favourite Book Custer in'76 – Mike Fox. “... an Officer brave and ambitious of distinction ...” (Charles De Rudio) by Peter Russell. Custer and The Crow's Nest by Mike Fox. “Deep Ravine Trail & Beyond” Field Trip, 26 Jun 2010 by Bob Reece. Book Review: ‘How the West was Spun’ a review of Nathaniel Philbrick's The Last Stand – Clive Sinclair. Statement of Account 1 June 2009 – 31 May 2010. 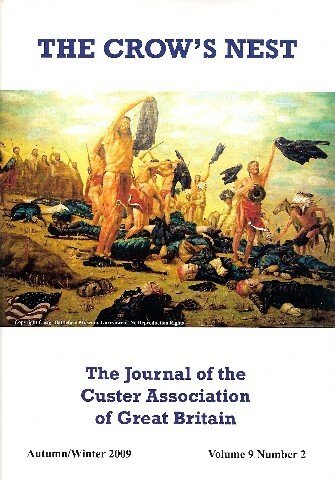 Back cover – ‘They Fought Custer’ by Michael Schreck. 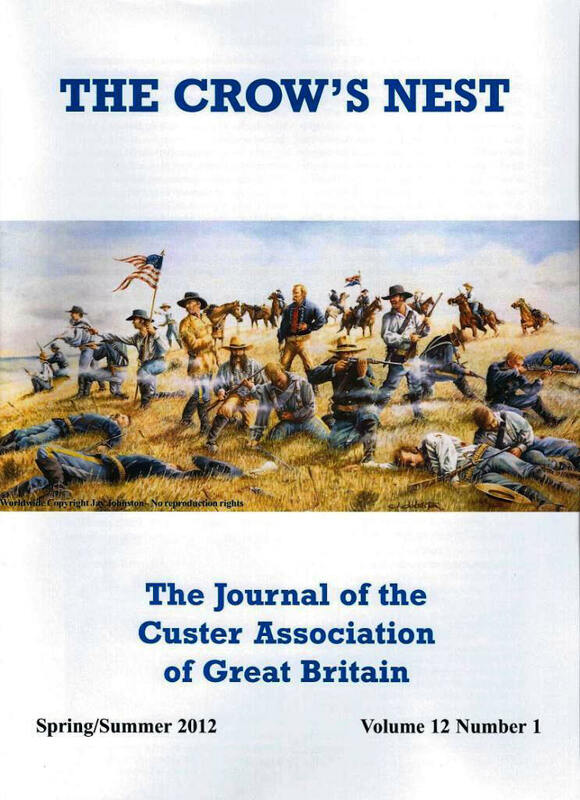 Front cover – ‘General Custer at the Little Big Horn’ by Giuseppe Rava. From the Chairman – Gary Leonard. Biography Giuseppe Rava – Artist. Biography Carlos Andrea – Artist. Letters to the Editor – Two letters on the article 'The Crow's Nest' by Mike Fox and Peter Russell's continued research into Charles De Rudio. Custer of the West – Derek Batten. My Favourite Book A Mighty Afternoon – C. Lee Noyes. A Tribute to Major Charles C. De Rudio – Peter Russell. The Deer Rutting Moon Gathering Report, 7 November 2010 – Mike Fox. Sergeant Major William H. Sharrow - more revelations by Peter Russell. The Battle of the Little Big Horn: Part 1 The Opening Moves by Colonel T. A. Gibson OBE with introduction by Francis Taunton. Rubbing Out Long Hair Pehin Hanska Kasota: The American Indian Story of the Little Big Horn in Art and Word – Kevin Galvin. 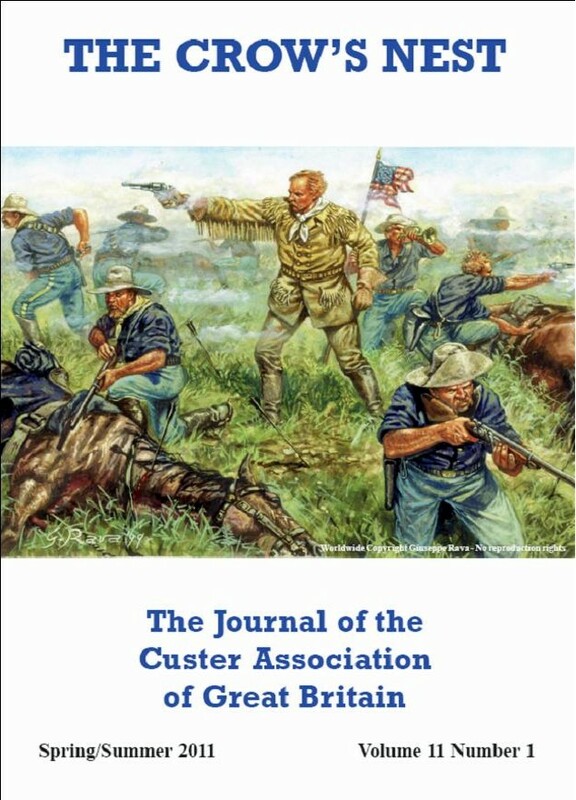 Front cover – ‘Custer Spots the Camp’ by Jay Johnston. Biography Jay Johnston – Artist. Biography Don Marco – Artist. My Favourite Custer Book or Books Custer's Last Stand/The Story of General Custer – Vincent Heier. The Planting Moon Gathering Report, 21 May 2011 – Mike Fox. Using the Web to Research the Battle of the Little Big Horn by Mike Fox. Cavalry Memories: A Scottish Soldier in the 7th US Cavalry by Murray Neil. The Battle of the Little Big Horn: Part 2 Showdown by Colonel T. A. Gibson OBE with introduction by Francis Taunton. Empire of the Summer Moon – Mike Christian. Film Review: Sitting Bull (1954) & 7th Cavalry (1956) – Mike Christian. Statement of Account 1 June 2010 – 31 May 2011. Front cover – ‘Last Stand Hill’ by Jay Johnston. Obituary – Tom O'Neil (1943-2012 – Ken Doran. The Deer Rutting Moon Gathering Report, 5 November 2011 – Mike Fox. My Favourite Custer Book A Road We Do Not Know: A Novel of Custer at the Little Bighorn – Lawrence Sherrington. Rhymes of the Regiment – George Kush. A Blighted Rank? – Majors in the Early Years of the Seventh Cavalry by Gary Leonard. True Heart The Story of Edmund Guerrier by Dee Cordry. 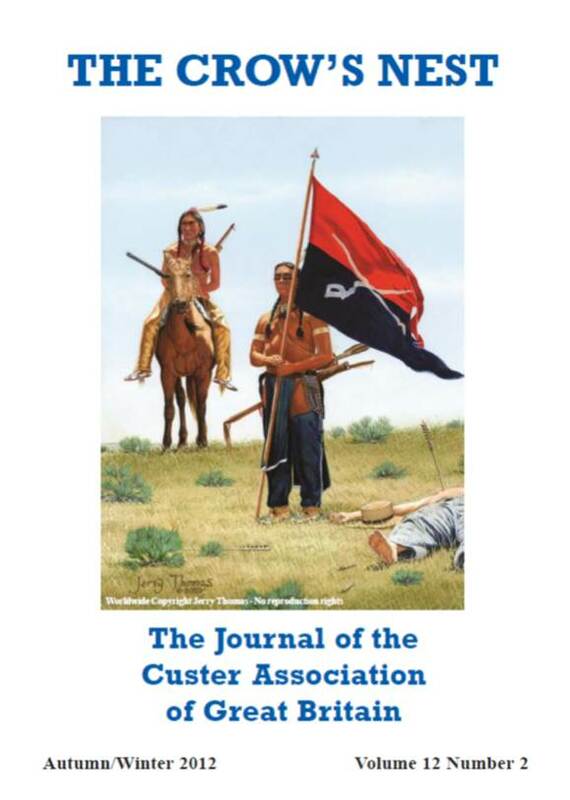 Documentary Review – American Experience: Custer's Last Stand – A Review by C. Lee Noyes. Back cover – ‘The Sergeant Major’ by George Kush. The Moon When June Berries Are Ripe Gathering Report, 30 June 2012 – Mike Fox. James Calhoun's Forgotten Dispatches in the 'New York World' by Marc H. Abrams. Custer of the West: A Review by Clive Sinclair. Statement of Account 1 June 2011 – 31 May 2012. Back cover – ‘Custer of the West’ Original Lobby Card from the Film painted by the late Frank McCarthy. Front cover – 'Come On you Wolverines' by Don Troiani. Biography Don Troiani – Artist. The Deer Rutting Moon Gathering Report – Mike Fox. A 'most desperate situation': Tom O'Neill's Valley Fight by Geoff Topliss. Schreyvogel, Remington and "Custer's Demand" by Marc H. Abrams. Custer at Gettysburg: Saviour of the Union? by Kevin Galvin. Back cover – 'Death on the Greasy Grass' - a poem by Neil Dowds. Front cover – 'Retreat to Last Stand Hill' by Jim Carson. Biography Jim Carson – Artist. The Moon When June Berries Are Ripening Gathering Report, 8 June 2013 – Mike Fox. 'A Gloucestershire Boatman' by Geoff Topliss. "A Very Lively Affair": The Skirmish at Tongue River Heights, 9 June 1876 by Marc H. Abrams. A Warning Flag? by Gordon Richard. 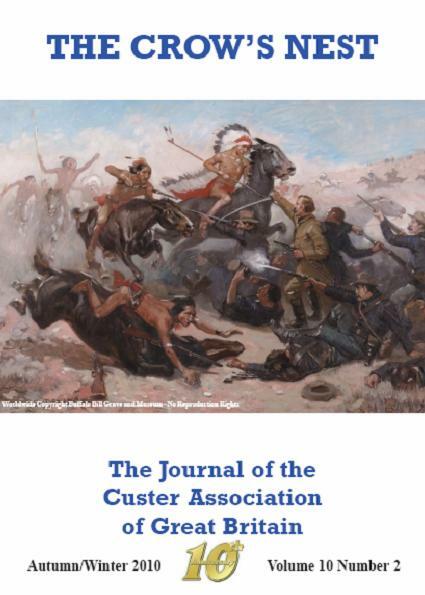 Where the Custer Fight Began – Kevin Galvin. Wild Geese of the Greasy Grass – Elisabeth Kimber. Kansas Forts & Bases – Gary Leonard. Thunder Rolling on the High Plains – Mike Christian. Custer's Women - Loves and Lovers – Mary Christian. Statement of Account 1 June 2012 – 31 May 2013. Back cover – ‘Panoramic Images from the Little Bighorn' by Sandy Barnard. Front cover – 'Dispatch to Benteen' by Jim Carson. The Deer Rutting Moon Gathering Report, November 2013 – Mike Fox. Five Essential Little Bighorn Sources by James Donovan. On the Edge of Disaster by Mike Fox. Cheyenne War – Gary Leonard. Little Bighorn: Postcard History Series – Kevin Galvin. Back cover – ‘Whiteman Runs Him' by Ken Hendriksen. 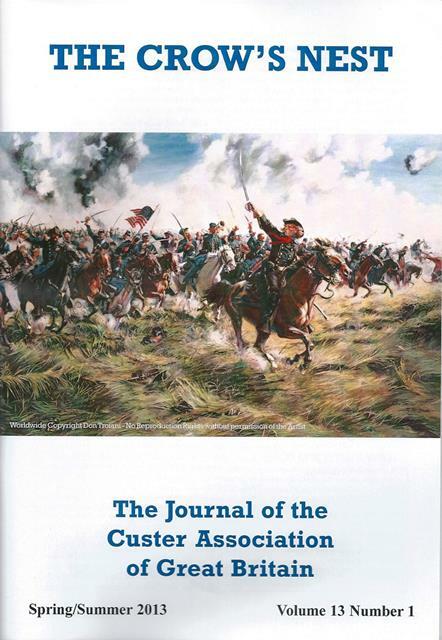 Front cover – 'Custer's Charge at Hanover Pike near Gettysburg' by Joseph Musso. The Moon When the Grass is Up Gathering, June 2014 – Gary Leonard. The Deer Rutting Moon Gathering Report, November 2014 – Mike Fox. Stimulants and Other Vice by Geoff Topliss. A Sunday Morning on the Little Big Horn Battlefield by Sandy Barnard. Back cover – ‘Custer's Last Stand' by unknown artist and painted for advertisement by Cream of Wheat in the 1930's.